DRY-MAX Compound is a unique blend of highly absorbent organic particles with a safe to use cleaning agent that leaves no residue. The compound is environmentally friendly and biodegradable. DRY-MAX Compound is an excellent restorative product for carpet cleaning. Feel free to use this compound in a routine program for maintenance cleaning. DRY-MAX will not harm any carpet types. The pH is at 6.0. The slight orange smell is pleasant and not overbearing. Cut bag under seal, spread the Compound on carpet. Twist and seal the bag with the twist-tie provided. Brush the Compound through the carpet and when dry, vacuum. Store box on its side between usage. DRY-MAX is a compound designed for Dry Extraction Carpet Cleaning. Dry carpet cleaning is used by commercial facilities, as well as private homes all over the world. The Dry-Max dry carpet compound is environmentally friendly and can be used to improve indoor air quality. Carpets act as filters in your home and business, trapping soil, allergens and other indoor air pollutants. Proper cleaning of your carpets can drastically improve indoor air quality. Dry cleaning carpet with the dry extraction method is extremely beneficial. Dry carpet cleaning is a catch phrase for many types of cleaning: 'dry foam', 'dry bonnet cleaning', 'crystallizing liquid' and 'dry extraction carpet cleaning'. The only method that allows immediate use of the space is the dry extraction method. This allows areas to be cleaned when the facility is in operation or the homeowners are home. The way the dry extraction system works, makes it ideal for cleaning traffic areas on regular basis. The dry cleaning system does not affect the backing of the carpet, thus will not shorten the life of the carpet. When wet cleaning is used the carpet backing gets wet and stays wet for a long period of time. In fact most dry carpet cleaning methods get the carpet backing wet as well. 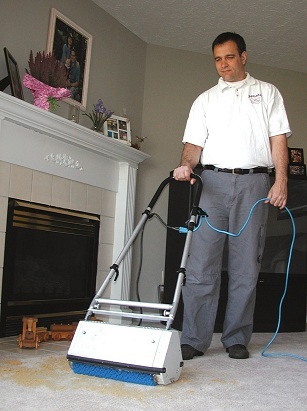 The DRY-MAX dry extraction systems will not wet the backing of any carpet. The system is amazingly designed to eliminate the risk of damage to the carpet fibers. The tiny base sponge material controls the moisture in the dry compound. Like a sponge works on a flat surface, the dry compound is moist not wet, allowing it to remove and hold the soil, as it is brushed through the carpet fibers. Carpet spots keep coming back? The main reason that spots come back after the cleaning is over, is from 'wicking'. This is caused from over wetting the spot when cleaning. When you use a liquid to remove a spot some of the liquid is lost in the process. The lost liquid ends up in the carpet base and backing. As the carpet dries, the spot gets lifted up the fibers of the carpet in the same way a wick works on a candle or lantern. 1) Allows for immediate use of the space that has been cleaned. 2) Will not harm the carpet backing. 3) Will not allow spots to reappear hours or days after the cleaning is over. 4) Does not leave a detergent residue behind to attract new soil. Carpets stay cleaner longer! 5) Deodorizing: The compound is a natural deodorizer with a fresh orange smell. Dry-Max is the ultimate dry carpet cleaning compound. We are also known as DryMax, Drymax, Dry-Max, DRYMAX and DRY-MAX. You can call us whatever you want. Just don't call the carpets -- cleaned with our dry compound dirty!